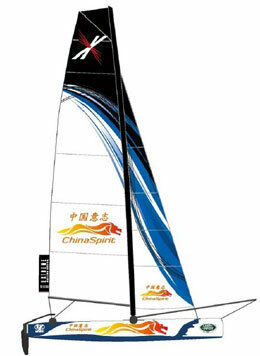 ChinaSpirit to represent China at the Extreme Sailing Series in Cardiff Aug 23-26. ChinaSpirit, the exclusive Chinese Multiplatform Performance Sailing Team, based in Shanghai, China and endorsed by the Government, is excited to exclusively represent China in the Extreme Sailing Series in Cardiff (presented by Land Rover) as well as the following 2 Acts in Nice (France), and Brazil later in the year. ChinaSpirit is proud to announce their invitation to sail in the Extreme Sailing Series, the original 'stadium-style' racing circuit and one of the most respected international sailing series in the world, combining the best skippers on the planet competing on state of the art 40 foot catamarans, the Extreme 40. "We are so excited, the Extreme Sailing Series is one of the best sailing series in the world, and to be invited to represent China at this incredible series is an honor for ChinaSpirit. This is our first race in an international ISAF* recognized event; and the Extreme Sailing series is the perfect fit for our ambitious goals to be the first true multiplatform Chinese sailing team and to represent China at many upcoming international regattas" says No.lle Gahan-Smulders, CEO of ChinaSpirit. Ms. Smulders adds "It's our goal to combine the best international sailors with Chinese sailors, to create mixed teams and use the international regattas as training opportunities for Chinese sailors, eventually building a Chinese Sailing Academy in China to promote Chinese youth sailing, as well as marine conservation; putting together a true Chinese multiplatform sailing team for world-class sailing events requires that we work with the best in the world and in China". ChinaSpirit's skipper is Phil Roberston, ranked #5 worldwide in match racing, and with experience already on the Extreme 40 and also on the AC45 of the America's Cup World Series. Phil says "It is an honour to be part of ChinaSpirit in the Extreme Sailing Series. I have been working with ChinaSpirit since its start, and I believe that together, we can accomplish great strides for sailing in China. The Extreme Sailing Series, with the best sailors in the world, is right where ChinaSpirit belongs, and we are keen to get going with ChinaSpirit to make an impact for China!" William Wu, experienced Chinese sailor, adds "I am so excited to sail for ChinaSpirit, the newest Chinese sailing team on the international regatta scene. After the America's Cup in 2007, and 2011, this is a real honor to sail in the Extreme Sailing Series for China. ChinaSpirit is doing all the right things to get great sailing results for China and being a part of ChinaSpirit is like being a part of history. Extreme Sailing Series, here I come!" Ms. Smulders says "This is just the first of many regattas to come for ChinaSpirit – and just like China ruled the seas six hundred years ago with 'Zheng He', we believe that with ChinaSpirit, it is Time for China to Make History….Again"
Established in 2007, the Extreme Sailing Series. is the original 'stadium-style' racing circuit designed for spectators, delivering high-performance action close to shore. Attracting some of the world's very best sailors racing 40-feet multihulls on short courses, the global circuit spans the Middle East, Asia, South America and Europe. The Extreme Sailing Series. also delivers a unique and bespoke VIP experience, with guests racing on board during the races. And sailing fans around the world follow the action via the live TV coverage online. The media value of the Extreme Sailing Series. has grown year on year since 2007, and in 2012 was valued at €27.8million including a 7-part TV series distributed to broadcasters worldwide, offering an attractive proposition to the circuit's partners that includes Series Main Partner Land Rover and other premium, world-class brands. Focusing on building its shore-side Race Village with live music and entertainment, this pioneering circuit will continue to innovate as it looks to the future. The Extreme Sailing Series. has been granted "Special Event Status" by ISAF*, the sport's governing body, and is a strong supporter of promoting sailing in to new markets and to new audiences. *ISAF - The International Sailing Federation is recognized by the International Olympic Committee as the world governing body for the sport of sailing yacht racing.